Last year's Mad Max Fury Road was one of the rare blockbusters that was just as critically successful as it was at the box office. Director George Miller's long-awaited sequel earned $153.6 million domestically and $378.4 million worldwide, from a $150 million budget. The film was well-received by the critics, and was even nominated for Best Picture as well. Today we have a new video that compiles raw footage from the film that hasn't been enhanced by CGI in any way. A user named ESPORTS_TV put this video from the Mad Max Fury Road DVD/Blu-ray special features on YouTube, a fascinating four-minute video compiled of footage from pre-production tests, behind-the-scenes videos and raw footage from Mad Max Fury Road. While most fans could tell that a majority of the film was shot without much CGI, this video goes to show just how many of these immense explosions and thrilling car chase scenes were captured in camera. This video also ends with a tribute to the production team, which you can read below. "Dedicated to celebrating the daring and ingenuity of the Mad Max: Fury Road Production Team." Back in July, we reported that the long-awaited black-and-white version of Max Max Fury Road may be coming soon, with this cut reportedly included on a German collector's edition set for release this fall. That report was never confirmed, but there still hasn't been any word on when American audiences may get to see this black-and-white edition. Director George Miller did tease that this version would be released "eventually," although he offered no details on exactly when we may see this version. From director George Miller, originator of the post-apocalyptic genre and mastermind behind the legendary Mad Max franchise, comes Mad Max: Fury Road, a return to the world of the Road Warrior, Max Rockatansky. Haunted by his turbulent past, Mad Max (Tom Hardy) believes the best way to survive is to wander alone. Nevertheless, he becomes swept up with a group fleeing across the Wasteland in a War Rig driven by an elite Imperator, Furiosa (Charlize Theron). They are escaping a Citadel tyrannized by the Immortan Joe (Hugh Keays-Byrne), from whom something irreplaceable has been taken. Enraged, the Warlord marshals all his gangs and pursues the rebels ruthlessly in the high-octane Road War that follows. George Miller has confirmed that he'll be back for a Mad Max sequel, but he has said on numerous occasions that he wants to make a smaller film before returning to this apocalyptic wasteland. There have also been rumors that Charlize Theron's Furiosa may get her own origin movie after the Mad Max: Fury Road sequel, but that hasn't been confirmed. 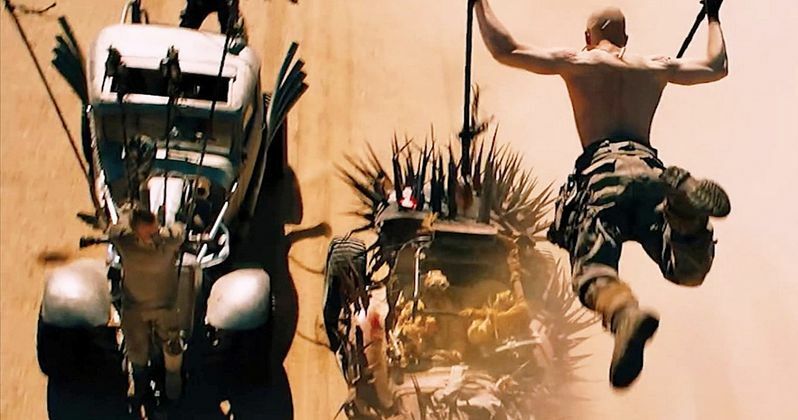 In the meantime, take a look at this video with raw footage from Mad Max Fury Road that doesn't include any CGI.